CQG Trader is an easy to use application. From streaming quotes to full communication with our trade desk. 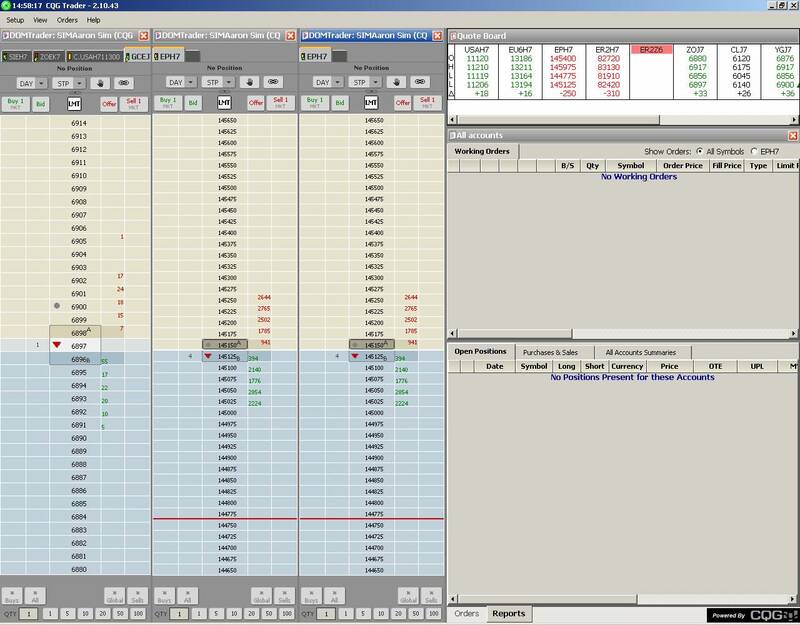 CQG trader The platform is streamlined for speed, eliminating charts and keeping the DOM, quote board, and order management systems prominent for the trader. It’s the perfect platform for someone who doesn’t need or is already working with charts, and keeps the most vital information in the forefront of the platform. Order Desk: Attaches to any CQG application, such as quote boards or charts. The Orders and Reports summary displays your: Account summary, Cancelled orders, Exceptions, Filled orders, Open positions, Parked orders, Purchases, Sales, and Working orders. Available Services: Dow Jones Newswires, The Hightower Report, LaSalle Street News, MarketG2 News, Market News International, and Need to Know News. CQG Trader has your key to opening the world of business. Trading is a universal passion. NonEnglish speakers can take advantage of using trading applications in their languages. Available Languages: Chinese, Japanese, Russian, Turkish. CQG delivers a high-speed consolidated market data feed covering multiple asset classes. Dedicated teams in five locations acrossthe globe actively maintain real-time and historical data quality. CQG Trader handles ever-increasing market data volumes, so you don’t have to. Powerful, flexible, and easy to use, CQG charts and studies combine with the best real-time and historical market data in the business to provide traders with critical insight into market activity. Spread orders, orders into aggregated markets, and smart iceberg orders are managed on CQG servers collocated with exchangematching engines. Today’s traders need reliable, high-speed access to electronic markets. The CQG Hosted Exchange Gateways provides customers with low-latency connections to major cash and futures exchanges. CQG software combines the world’s most sophisticated analysis tools with a high-performance market data feed to enable your decision making and execution.